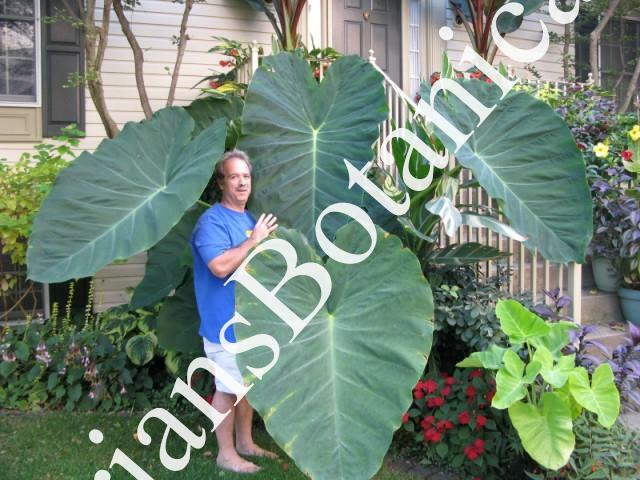 Colocasia ‘Jacks Giant’ is a monster of the Colocasia world. This plant can grow to full size in one season given the right light and watering. The leaves area dark green heart shaped and can grow to 3 feet long or more and 2 to 3 feet wide. The petioles green as well. I have found this is not the same as the Common form which is commonly sold in stores. They look similar but Jacks Giant has different colored tubers. It is believed that Jacks Giant is a tetraploid having extra chromosomes which make the plant larger with thicker leaves and very vigorous. A great plant for northern growers wanting a large plant in one season. It also does well in large containers and should do well in tropical gardens to. Foliage: Very large heart shaped green leaves. Height: 8 feet tall or more in idea conditions. Zone: 7 and up – Reports of over wintering in zone 6 with heavy mulch.